St Matthew Orthodox Church serves Green Bay, the Fox Valley, and Door County. The parish was founded in Appleton at the request of a group of dedicated lay people and through the priestly ministrations of Archimandrite Hilary (Madison). When a shift in dominant membership from Appleton to Green Bay occurred, the new Orthodox community began to meet in rented quarters in Green Bay. During all this time, until 1992, Fr Hilary faithfully and sacrificially served the mission, enduring many hours every weekend of riding public transportation back and forth from Chicago. At the request of Fr Hilary and His Beatitude Metropolitan Theodosius, who was Locum Tenens of the Diocese of the Midwest at the time, Fr Michael Herrick, PhD, a priest and psychologist attached to St Mary’s Cathedral, Minneapolis, was appointed as the first resident priest, beginning July 1, 1992. This was made possible by a 3-year grant from the Diocesan Department of Missions. While limited by the rented space and its use by others as well, more of the Liturgical Year began to be celebrated. The attendance at the worship services began to increase, and new people began to hear, learn about and be converted to the Orthodox Faith. During this time in our history (1992-1999), it was necessary for Fr Michael to rely on secular employment for most of his income. While resident and accessible, he functioned on a half-time and later on a full-time basis as a psychologist in the local State maximum security Prison to help support himself. He is now retired from the State. As part of the growth picture, in October of 1994, a building was purchased and provides space for both a temple and church hall. Now, at last, the Church Year can be celebrated appropriately, and this alone is a major change in the nature and functioning of the St Matthew Community. Many of our people live as far as 30 to 50 miles or more from the church, and their faithful attendance continues to be a sacrifice blessed by God. In 2003 Fr John Wehling moved to Green Bay to serve the parish. A former protestant pastor, Fr John attended St Tikhon’s Orthodox Theological Seminary before being ordained to the holy priesthood on the Sunday of Orthodoxy in 2003. The membership of the parish has continued to grow in the last six years as more and more people in Green Bay and Northeast Wisconsin discover the riches of the ancient Church. In June of 2011, with Bishop MATTHIAS’ blessing and encouragement, Fr. John accepted an opportunity for ministry in Livonia, Michigan. Fr. Maximus Cabey was assigned and appointed by Bishop MATTHIAS as the new Rector for St Matthew Orthodox Church. He was ordained to the holy priesthood on the Feast of the Universal Exaltation of the Cross by Metropolitan Jonah on September 14th 2010 at Three Hierarchs Chapel at St Vladimir’s Orthodox Theological Seminary. Fr. Maximus graduated from St Vladimir’s Orthodox Theological Seminary in May of 2011. He has an extensive background in church ministry and in the business world, and both he and his wife, Matushka Photini are energetic converts to the Orthodox faith. Fr. Maximus and Matushka Photini moved to Green Bay on July 1st 2011 and have been busy ministering in the parish ever since. 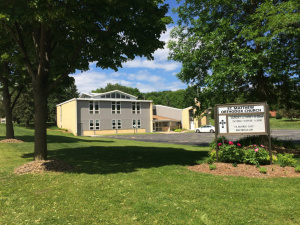 On Wednesday April 30th, 2014 St. Matthew Orthodox Church purchased a former Presbyterian Church building at 607 Ravenswood Drive in Green Bay. We moved in the week of May 11th, 2014 and had our first services in our new building on Saturday May 17th, 2014. The Lord continues to bless and grow the Orthodox Church in Green Bay. In September, Bishop Paul assigned Father Eugene Wozniak to our parish. Father Eugene, his wife Antonia and their two daughters, Elizabeth and Sophia arrived in Green Bay in October. Father Eugene is a graduate of St. Vladimir's Seminary where he twice toured the country with the seminary's Octet male choir. He served in the military as a US Navy chaplain at Camp Lejeune NC, Oceana VA and Juneau AK. He also served as an Othodox priest and chaplain in Iraq, Afghanistan and other countries in the Middle East and Europe. Green Bay, Wisconsin - The congregation of Saint Matthew Orthodox church in East Green Bay has completed the installation of icons by the Russian born artist Dmitry Shkolnik. 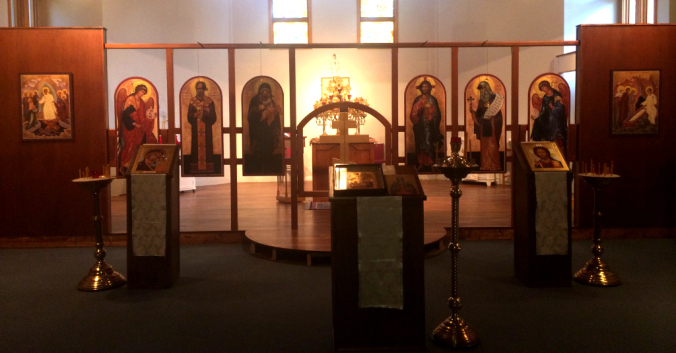 The icons were started by Dmitry at his studio in California and have now been installed in the Altar at St Matthew. This phase of the beautification project took about two weeks for installation. Orthodox churches are traditionally beautified by hand painted Iconography which ‘is an essential expression of beauty and revelation in worship and faith’ says Father Eugene Wozniak, the priest at St. Matthew. Our community is excited to start this project.